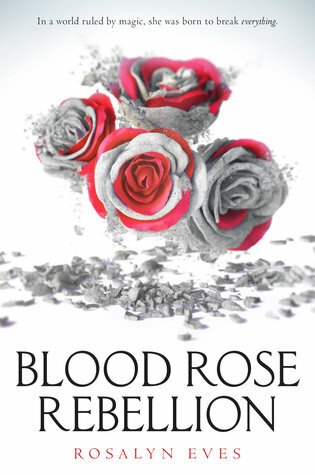 I finally had a chance to do a little reading, so I picked a YA fantasy: Blood Rose Rebellion by Rosalyn Eves. This entertaining, suspenseful novel is set in the mid-1800s in an alternative fantasy world of England and Hungary, where the ruling elites maintain their status and power not only through bloodlines and money, but through magic. Years ago, a spell was cast by a small cadre of the nobility to concentrate access to magic in the hands of a few. The "Binding" prevented outsiders who might have magical talent from ever learning how to use it. While the rationale behind the Binding made some sense (it also trapped dangerous magical monsters within the spell so that they couldn’t harm humans), in practice it led to grave abuse of power. Lady Anna Arden is a young woman from a well-placed magical family destined for high English society. However, at her confirmation she was unable to perform a spell and was declared Barren. Since then, she has been kept from the public eye. However, at her sister’s debut in society, Anna inadvertently breaks her sister’s spell, causing considerable damage and raising alarms throughout "The Circle," the ruling body. Her talent is unique and potentially dangerous. It’s a type of anti-magic that threatens their entire way of life if she can’t be controlled. Anna’s parents and grandmother whisk her off to Hungary, her grandmother’s home country, in the hopes that the scandal will die down and The Circle will lose interest in her. Instead, Anna becomes embroiled in a plot to break the Binding spell and free access to magic to the masses. This does not go over well with those in control. This is a well-done fantasy with intricate world building and a quasi-historical setting that Eves brings to life with a bold sympathetic heroine, a strong love interest, and new friends who are fully rounded characters. Newly released, this is billed as Blood Rose Rebellion #1, so I look forward to the next installment! I knew I'd signed up for this tour but couldn't find the info about it so thought I'd missed it. I ran my review early, but loved the book so much I'm posting it again. In fact, he was an able administrator and was very much loved by the Roman people, if perhaps not so much by the Senate. Apparently, he took great pleasure in athletic and musical competitions, which was considered beneath the dignity of the office. No surprise, he always won first place. It was a very interesting exhibit and new perspective. 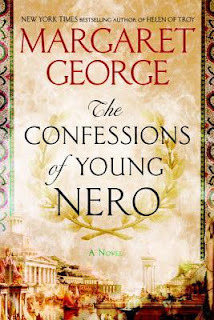 So I was eager to read Margaret George’s new book, The Confessions of Young Nero. Margaret George is well known in historical fiction circles for epic biographical novels. I’ve had her on my to-read list for a long time. Nero was a member of the imperial family, though he was not expected to become emperor. His father died when he was young and his mother, Agrippina, had been banished. During Caligula’s reign, Nero was raised by an aunt. (He barely managed to survive Caligula’s casual murderousness.) The manipulations of his family to get rid of Caligula and to jockey for position at court make for interesting reading. Things really get going when Claudius becomes emperor and Agrippina returns. She reclaimed her son and started plotting. During his formative years, Nero (then Lucius) had no dreams of seizing power. He was content to study history with his tutors, to sneak into an athletic training camp to wrestle and race, and to learn to play the cithara. Nero is presented as a sensitive and intelligent boy/young man, cursed with a fiercely manipulative mother. Agrippina married Claudius and had him adopt Nero. Claudius’s own son was displaced. To help move things along more quickly, Agrippina employed the family poisoner, Locusta, whose point of view is presented in a few chapters for additional historical perspective. Nero watched with fascination and horror. At first, he was merely swept along in the current that carried him to the throne. But, once he became emperor, Nero discovered his own taste for power. George does a wonderful job showing Nero’s growth, his loss of innocence, and his slide from a boy with a conscience to a power-crazed dictator who ceases to listen to his advisors and who believes he is entitled to whatever he desires just because his power is limitless. He’s not a warrior as his predecessors were, which means Rome is able to enjoy a period of peace and prosperity, but he is extravagant and vain. The book is long but reads quickly. It weaves together politics, court and family intrigues, and romance. It carries the reader up to the burning of Rome. Here, the story breaks off but with the promise of a second novel in the works to continue Nero’s story. For anyone who loves Roman history or epic biographical fiction, this new novel by Margaret George is highly recommended. Life keeps happening and it’s really cutting into my reading and blogging. 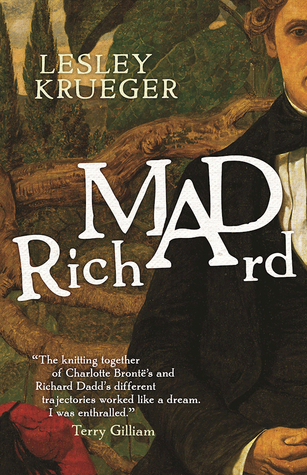 Still, I did squeeze in this gem, Mad Richard by Leslie Krueger. This literary historical novel introduces us to Richard Dadd, a talented nineteenth century British artist who was mentally ill, grew increasingly violent, and was eventually admitted to Bedlam. The novel begins with a visitor to the insane asylum who comes specifically to speak with Richard: Charlotte Bronte. The encounter did happen, though the details here are fictional. The story branches out to follow the lives of both these characters. Although they don’t come in contact again, they know some of the same people so the links between them hold the separate narratives together. One person who looms large is Charles Dickens. A boyhood acquaintance of Dadd’s, his path keeps crossing Dadd’s and they keep tabs on each other’s professional careers. Bronte and Dickens are not friends but are literary contemporaries. Charlotte’s sections are somewhat dreamy, as the author is at a later stage in her career, her siblings are dead, and she is contemplating living out her life as a spinster caring for her father in the parsonage. It’s not the life she particularly wants. She has fallen in love with her editor, a handsome younger man, who supports her as an author and friend, but who shies away when her deeper feelings become more obvious. Charlotte is wooed in turn by her father’s curate, a sober, quiet man. Charlotte’s father sent him away, appalled that he dared approach his social superior, the famous author. However, Charlotte keeps him on a string while she decides what course to take. She fears life alone but also fears a life without writing and worries marrying the curate will cut short her career. Dadd’s life is more tumultuous. One of nine children, Richard is his father’s favorite. His father is a successful chemist who has pinned all hopes for the family’s rise in the world on Richard. This exceptional son is given a first class education and, when he decides he wants to be a painter, tutors are hired and connections are tapped. Richard also finds his own group of up-and-coming artists, and it seems he is on his way. But Richard is slowly losing his mind. He immerses himself in his art and his interpretation of art, but his thoughts drift farther and farther from reality. Part of the time he frightens himself, but other times he is inspired by his own intellect. Pushed by his father to accept a position accompanying a gentleman on a tour of Egypt, Richard falls off the cliff of madness in the exotic climes. By the time he returns, he is hearing the voices of Egyptian gods telling him to commit murder. This is a beautifully written book that succeeds in weaving together the stories of these two very different people, who have in common ambition, a love of art, and an ambivalent feeling about fame. Charlotte’s story is bittersweet and grounded in reality. Richard’s is horrifyingly tragic and surreal. The author does a wonderful job of presenting his descent into madness in a vivid, realistic, and sympathetic way.